Commenting on the upcoming presidential election, evangelical leader Franklin Graham said both "candidates are flawed" but all Americans need to pray and then get out and vote because this "is the most important election of our lifetime," and "we're on the precipice of losing the United States of America." He also urged Christians to get involved in the political process. "President Obama in his early life was a community organizer," said Rev. Graham during a Nov. 1 "Pray and Vote Special" hosted by the American Family Association. "We need Christians across this country who are community organizers, who are out helping Christians to run for office and getting behind those Christians, financing them, and then working for them to get them elected." "[I]f we don’t, we’re going to lose this country," he said. "This is probably the most important election in my lifetime; I’m 64 years old." "We’re on the precipice of losing the United States of America, and we better get out there and vote," said Rev. Graham. "That 38 million [evangelical voters], I’m telling you, don’t stay home, and don’t let someone try to tell you that your vote doesn’t count, and don’t try to let someone tell you that you don’t like those candidates, so you’re going to stay home as a protest." "Listen, both of these candidates are flawed," he said. "Both of them. But we’re not voting for a pastor. We’re voting for somebody who’s going to be appointing the next Supreme Court justices." Franklin Graham, 64, is married and has five children. He is the son of world-renowned Pastor Billy Graham and the latter's late wife, Ruth Bell Graham. 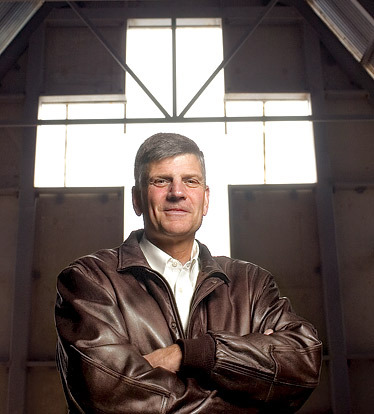 Franklin Graham oversees the Billy Graham Evangelistic Association (BGEA) and the international Christian relief group Samaritan's Purse. He frequently preaches in the United States and overseas.